34 Comments on "How To Keep Cookies Crisp"
I’ve made Pizzelles cookies for years, but this year they came out soft and thick as opposed to thin and crispy. My mother started adding baking powder. Could that be the problem or something else? When I made Nestle Toll House chocolate chip cookies growing up, the recipe called for baking powder. The cookies were always softer. Now the recipe calls for baking soda. I’ve noticed the cookies are much crispier. I started substituting baking powder for the baking soda. The cookies are once again soft. I use 4X more baking powder than baking soda. I have a cut out recipe that is super crunchy but as soon as i frost them the get soft. I use the typical powdered sugar glaze but have tried pre made cookie frostings. Would the baking soda trck work with frosted cookies or is there a better frosting option? Royal icing usually won’t make cookies softer if the cookies are completely cooled before frosting and the frosting is completely harden before storing. But in truth I have never been able to keep any cookies crisp for more than a day or two – but the baking soda does seem to keep them very crispy for those couple of days. I would like to start selling my family’s homemade Biscotti at the local Farmers Markets. I’d like to package from 2-5 together, but have yet to find a way to keep them risp, but not dry. Please let me know your thoughts! P.S. My recipe for Biscotti are not the typical very hard outside texture. Mine are crisp, yet very light inside. So difficutlt to keep that texture for packaging. Make small packages or bags out of parchment paper (not wax paper). Also make sure that there is not a lot of extra air space in your packages. Sandwich bags and zipper slide block type bags Etc aren’t really that great. How do I keep my soft cookies that way.? To keep cookies soft place them in an air tight container with a slice of basic white bread. The cookies will stay soft and the bread will be hard. I made a batch of cookies yesterday, for Christmas. Cooled them overnight and this morning they were soft! the lace cookies are a disaster! How can I re-crisp them? I’m trying your suggestion with the baking soda and then I covered them and put them in the frig. I simply don’t know how I can restore the others? Please help! This is amazing; I wish I knew this method existed years ago. Fantastic! I guess you will have to try. One way to keep cookies crisp may be to freeze them. By the way, what is this recipe? Maybe there’s something in the way you are making them that’s fighting you. You suggest using baking soda. I have bicarbonate of soda and baking powder (apparently a mix of bicarbonate of soda and cream of tartar). What is baking soda.? I do not know if either of these would absorb moisture. I will , however, try freezing my surplus sesame biscuits, which need to stay crisp. Baking soda and bicarbonate of soda are the same, just two different names. Bicarbonate of soda IS baking soda. Thank you for the cookie storage idea. I am trying it today and will let you know later how it worked. Appreciate the post. I am making sugar cookies and it is humid. I can run air conditioning to bake, but I need to decorate them. I am making 180 decorated cookies, so. I can not recrisp them or wait till last minute. How do I use the baking soda with Royal icing decorated cookies and keep them crisp after I no longer use air conditioning. I usually make cookies in Dec. and storing is not a problem. It’s June and humid. I’m sorry this is out of the range of my knowledge. You might be able to find some help with an internet search. Lin, I have the same question with Royal iced cookies. Were you able to find out how to keep this type of Cookie Crisp? I usually put cookies in a sealed tupperware container and put pieces of fresh bread in with them..but they stay Soft, but i want them real crisp like the chocolate chip cookies my Mom used to make…that just break and crunch.I will try the baking soda. MY QUESTION: How do I thaw them and have them stay crisp? They are in air-tight containers lined with foil, wax paper between layers, and then the entire container is wrapped in “Heavy Duty Foil”….. I left a couple of cookies on a plate in the china cupboard for my husband to sample (since they are a newly discovered recipe), and they were not crisp any more. Quite soft. Very disappointing to say the least !! I don’t know if you answer me via my email, or here, so I’ll check both places. Based on your description, I would be more concerned about the cookies being fresh, not crisp. That is a long time to freeze cookies, especially if they have air around them. I’m not an expert, just a home cook like you, but when I freeze cookies (or anything) I always do it in air-tight freezer bags with all the air removed. Then I put them in a second freezer bag but I’m concerned that there is air in your container, even if it’s wrapped in foil, etc. I did some research and cookies tend to lose crispness when frozen so they say it’s best to thaw them at room temperature but out of the packaging. If you thaw them still wrapped, they will retain moisture. I would anticipate them losing crispness but you can easily re-crisp them in a low oven (300°F) for 8 to 10 minutes. Once they are crisp, they should never be wrapped in plastic. I hope this is helpful and good luck! 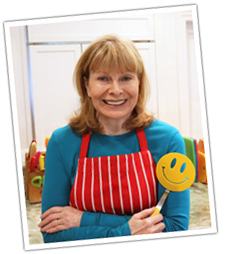 Jenny – thank you so much! I usually start my Christmas cookie baking in August, and freeze them – I’ve done this for years and years, and not had any that didn’t taste fresh once they’ve thawed. But these crisp cookies are a new recipe, so I really appreciate your tips. Since they’re already in the freezer in containers and wrapped in foil, I’ll leave them that way – and then I’ll thaw them a couple of days before the party and if they need re-crisping, I’ll do it as you suggest. I’m going to freeze other cookies the way you suggest. With just two staples, wouldn’t the baking soda leak out and spill onto the cookies? Mine does not leak out but if you’re concerned, just make sure it’s upright. You can still squash it down with the opening at the top. I don’t get it, where do you put the cookies? in the coffee filter with the baking soda or just in the airtight container? 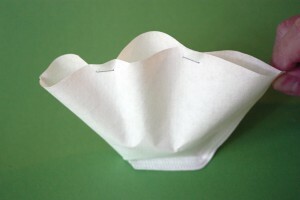 what do I do if I do not have a coffee filter? You put the cookies in an air-tight container and just drop the coffee filter (with the baking soda inside it) drop it in there next to the cookies. If you don’t have a coffee filter, you could use a tea ball filled with baking soda and leave it inside the container with the cookies. 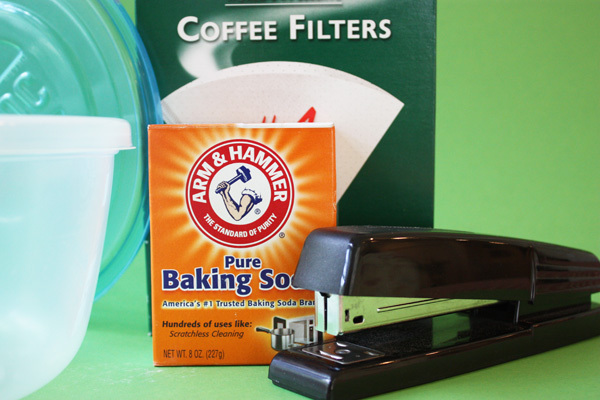 The idea is that the baking soda needs exposure to air and using a coffee filter avoids a big mess in the container. I’ve never tried it but maybe you could put the baking soda in the bottom of the container, place a paper towel on top of the baking soda, and then lay the cookies on the paper towel. Whatever it takes to keep the baking soda from landing on the cookies. I hope that helps. I actually tried your idea with the paper towel and then laid the lace cookies on top of that, layering it. Don’t know when to check it and hopefully they will be crispy for Xmas!!! Thank you for your suggestions! What a great and useful tip! I always knew you could make cookies soft with bread, but I really didn’t know there was a way to keep certain cookies crisp! Thank you for this, and I will give it a try!